Home insurance rates are on the rise, and one of the reasons is the increasing amount of water damage and floods that homes are enduring. There are many ways to protect your home from water damage. Below are ten solutions that cover a variety of sources that cause water damage, whether it is sump pump breakdowns, plumbing, or floods. The hoses on your dishwasher, washing machine, and your refrigerator can easily become loose. Inspect them for cracks or leaks and replace them at least every seven years. 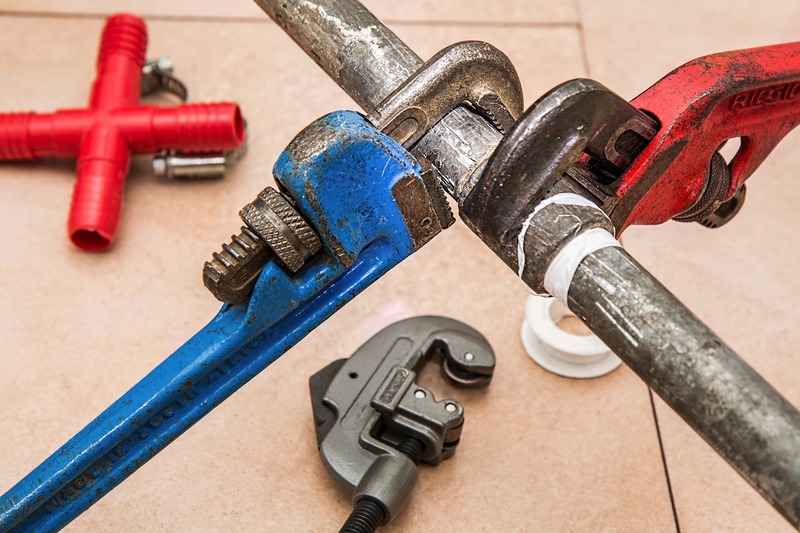 Consider investing in water leak sensors that alert you when they detect possible problems in the home. Water heaters should be partially drained every six months. This will prevent erosion and rust from building in the bottom of the tank. Draining the tank will also allow you to check the pipes for cracks and leaks. If possible, have a professional elevate the water tank so that it isn’t sitting directly on the floor. Keep all floor drains clear of obstructions. If you have a sump-pit and sump pump, inspect them, and ensure the pump works. Check the pump’s discharge pipe for blockages and aim it away from your home. It should be draining towards your lawn or garden. Installing a battery-driven backup for the sump pump is an investment for being flood prepared. If you notice condensation on windows, wet stains on the walls, or musty smells the humidity level in your home may be too high. To help prevent dampness and mildew, always use exhaust fans following hot showers. When you’re leaving the house for more than three days, turn the temperature on the air conditioning up, not off. Rain and wind only need a small opening to cause a lot of damage. Give them an inch under a shingle or a window, and they will take the entire home. If you notice any air flowing through window or door deals, any cracks in the floors, or lose shingles, buy sealant as soon as possible. Also, check the bathroom walls and tiling for cracked or missing caulk and grout. Water can sneak behind the tiles and leak down into the floors or create mold behind the walls. If water damage or a flood were to happen inside your home, you want to avoid losing valuable items. Consider installing shelves in the basement to keep items off the floor. Sturdy plastic containers are best for storage of smaller items. You need to protect unused furnishings or appliances with sealed plastic bags. Since water damage in the basement rises to an inch or more, keep all electrical wiring one inch above the floor. This action helps prevent electrical accidents and expensive repairs. It is also smart to label the shut-off valves for the water supply lines. As a result, it helps if you should find any leaks in pipes or if one happens to burst. Carpet may seem like a better choice in some rooms, especially a basement for a family-friendly environment. However, with water damage and floods being prominent in basement areas, it may be time to reconsider your options. Using large area rugs, accents, or carpeting remnants can be just as nice, plus can save a lot of grief should damage occur. An obvious way to clog a pipe is to pour fats, oil, and grease down your drains. Most people don’t realize the issues that arise from this action. These elements solidify in your drains and cause build-up that leads to water damage. Over the years, sidewalks, driveways, patios, and decks may shift and cause water to pool. Repair any damages you can to get water away from your home. Ensure the proper grading of your lot so that water can drain away from your foundation. Landscaping your yard with plants and vegetation will also help minimize soil erosion. Regularly cleaning and maintaining your gutters will help keep blockages away. Even if gutters are free of debris, there are still chances of leaks and overflow with heavy rains and snows. Use a rain barrel to help catch runoff and make sure the downspouts extend three to six feet away from your home. Water damage to your home is never a good thing. However, you can prevent some damage. Nearly 40 percent of homeowners have experienced water damage in their home at some point. These tips will help prevent problems, but if unexpected water damage or a flood occurs in your home, call DeShano Restoration immediately at 1-800-234-0800.